Lisa's latest chocolate post! Read all about it! 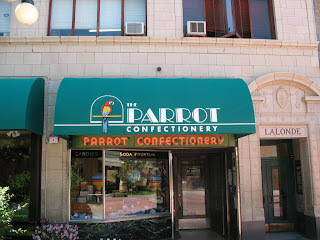 Instead of a recipe today, I am sharing about my favorite candy store. 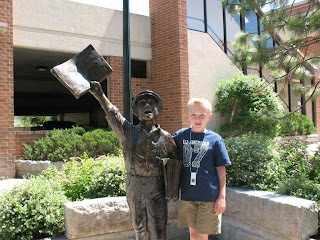 It's in the town I was born and raised in - Helena, Montana, and has been there since 1922!! My mother and her friends would "hang out" there in the 50's, listen to the jukebox and order from the soda fountain. I was introduced to it at a very young age and it is now a MUST every time I go back to visit. I was just there a little over a week ago! My tradition is that I have to go sit in a booth and order a sundae. All the dishes are small and cute. 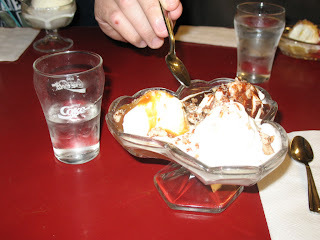 You may be surprised by just how tiny the sundaes are (so unusual these days! ), but it really is all you need. That's because the ice cream and toppings are all homemade right there in the back. My favorite sundae is the caramel/marshmallow - one scoop of creamy vanilla ice cream covered with half caramel and half marshmallow. I know - no chocolate - but I do love all the chocolate stuff, too. 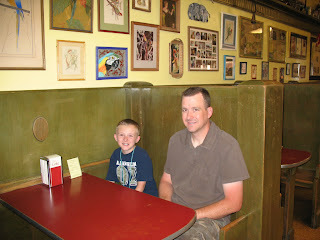 Hubby and son in a booth - the booths are the same as more than 50 years ago! This is the Parrot Special - 3 scoops of ice cream with 3 different toppings, pecans, whip cream, and a cherry. I chose caramel, marshmallow, and hot fudge. Proportion doesn't look right in the pic; this is all small - that water glass is no more than 4 inches high and those are little espresso-size spoons. After eating my sundae, I HAVE to head to the candy counter. I usually choose a few chocolate-covered pieces, some caramels, and thin mints of a variety of flavors. I realize I took no pics of the candy I ordered - ate it all up before I thought about it!! And I lost my nerve to snap a pic of the candy counter - there were too many people around. My husband and son are happy to be a part of this tradition and have already been there many times with me. They love the sundaes and the candy, too! Well, that's my chocolate for today. I know you have things to say about chocolate and great chocolate recipes. Please take a minute to link up a chocolate post below, no matter if new or old, so we can all share the chocolate! :) If you need ideas, you can look here. Oh, now that looks like somewhere I would definitely want to go. 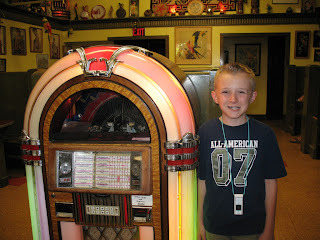 I bet they have all old tunes on that jukebox don't they? I love nostalgic places with some history behind them. How sweet. It reminds me of a place in Fredericksburg, TX. oh my that's very very tempting! Oh my, how SWEET!!! Pun intended. I love old traditions, they are so important and it is great when you can share it with your family. Good job!!! I remember this post but I wonder why I didn't comment on it? Did I not like you as much then? Was there no pressure of a Top Commentator gadget on the side bar? Hmm. Well in any case I"m leaving one now. I expect newer and updated pictures when you go visiting here again. Eat a Sundae or two for me. Big I can't believe I let this one slip by me size hugs to you.